I hope you read Part 1 and now I’m happy to share Part 2 of my ShiBlog! Breathe! An often overlooked basic skill in swimming is the ability to time your breaths. If you’re not comfortable breathing while swimming, you’ll struggle to make streamlined, coordinated movements. The basic idea involves breathing out through both nose and mouth when your head is underwater, then lift your head to the side, taking a full breath before plunging your face back down under the surface. We practice this motion holding onto the side of the pool with outstretched arms. Streamlining/Gliding through the water is a basic skill to master before kicking and paddling, it helps you to get used to the sensation of moving through the water headfirst. Try gently pushing off the side wall of the pool with your arms stretched out in front of your head. Keep your head face-down in the water and glide until you slow down. 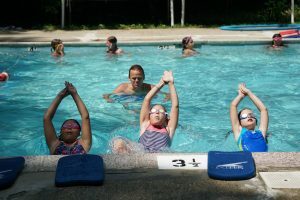 Beginner swimmers often find themselves chopping through the water with their limbs. That’s fine. It takes a while to get a feel for moving your limbs in time. You must also get used to moving muscles in your lower back, abdomen and hips to power you forward. Similarly, try to let your legs come up behind your body, and keep a slim, streamlined position. Over time, this reduces drag from the water and makes you a more efficient swimmer. The Freestyle Stroke or front crawl is often the preferred stroke of seasoned swimmers. It uses alternating arm movements with an above water recovery. The legs execute a flutter kick. Freestyle is fast and efficient. Breaststroke is the most popular swim stroke of all. In breaststroke, both arms execute half-circular arm movements at the same time under water in front of the swimmer. The arm recovery also occurs under water. The legs simultaneously execute a whip kick. Breaststroke is often the first swimming stroke taught to beginners. Breaststroke is the slowest of the competitive strokes. 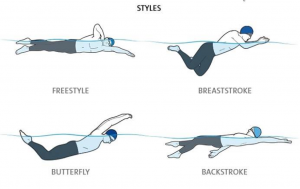 The Butterfly Stroke stands out among the competitive strokes because of its unique and spectacular technique. It uses a symmetrical arm stroke with an above water recovery. It also uses a wave-like body undulation and a dolphin kick. Butterfly is the second fastest swim stroke after freestyle. As its name suggests, Backstroke is swum on the back. It uses alternating circular arm movements and an above water recovery. The legs execute a flutter kick similar to the one used in freestyle. Backstroke is faster than breaststroke but slower than butterfly. The Sidestroke is an old swim stroke swum on the side that uses a scissor kick and asymmetrical under water arm movements. It is easy to learn and can be an interesting alternative to the popular swim strokes. It is also used by lifeguards to rescue victims. Elementary Backstroke is a swim stroke that is swum on the back, using a reversed breaststroke kick and a simple synchronous under water arm stroke. Elementary backstroke can be used as one of the first swim strokes taught because its technique is very simple. Diving into the pool is a basic swimming skill — even if it starts out of the water. Always practice diving in a deep pool with a lifeguard on duty. When you begin, diving may only involve putting your hands together above your head and gently curling your body forward toward the water until you fall in, headfirst. As you progress, try jumping slightly and straightening your legs behind you as you dive to enter the water smoothly. According the National Institute of Health, any regular exercise improves focus and ability to retain memories! Swimming is good for the body and mind. It can instantly lift your mood. Water’s buoyancy reduces stress by giving weightless feeling only felt in the water. Studies show that many swimmers report an instant mood improvement and over time they can even benefit from new relationships that are possible when joining a pool, swim class, or swim team. 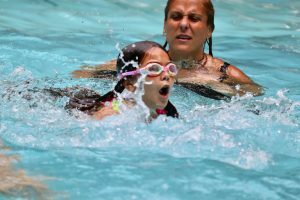 Research from Australia found that children who begin swimming at an early age develop physical milestones, language skills, and confidence earlier than those who do not. As a final benefit, swimming also increases blood flow to the brain! Here at Shibley, EVERYONE BECOMES A SWIMMER! An hour of vigorous swimming can burn up to 650 calories – more than walking or biking. The resistance of water is over ten times that of air, making swimming an efficient way to improve muscle strength.